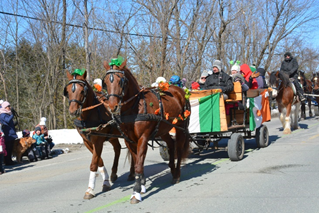 The Irish Heritage Festival, organized by the St. Patrick’s Society, celebrates the rich heritage passed down by Irish immigrants who brought their love of music, dance and story to the Eastern Townships. The Festival program includes music, dance, history, story-telling, theatre and the St. Patrick’s Parade. Many events are free or by donation. All are welcome! Legion Hall 235 College N. Richmond Everyone is invited to a fun-filled afternoon. All proceed of the sale goes to the Richmond Legion. For further information, please contact the branch at (819) 826-3444. Admission at the door. Richmond County Historical Society is sponsoring an Irish Spoken Word event for local youth who are invited to present a Celtic inspired poem, song, or recitation and must register at 819-826-1332, esdhealy@gmail.com or the RCHS Facebook page prior to the March 1st deadline. Participation prizes will be awarded. Derry Girls (season 1) will be projected onto a big screen. Derry Girls follows the personal exploits of a 16-year-old girl and her family and friends during the Troubles in the early 1990s. Popcorn and laughter assured. Patti Warnock - The Countess of storytelling has participated in numerous cultural activities and festivals throughout Quebec, Canada, the Caribbean, France, Iran, and China. Her repertoire (for the young at heart) consists not only of traditional style tales, but also of her own creations, where reality and fiction walk hand in hand, and which are based on the reality of everyday life events, and on her own childhood in rural Quebec and in northern Canada. Sandra Picken Roberts - Slate painting artist - Well known in her local community of Cleveland-Richmond, Sandra will demonstrate her techniques for painting on slate, a plentiful local material. Sandra’s work is currently being displayed in Québec City at the Galérie Zen, le petit Champlain. Andrea Barrie – Artist-Designer - Andrea has been wowing the locals with her talents for many years. She will demonstrate chalk painting on a variety of surfaces. Chalk paint gives new life to old furniture! Melanie Ann Fallnbigl – Multidisciplinary artist, art teacher - Melanie will be exhibiting Pebeo mixed media. Melanie comes from a family of artists and grew up surrounded by musicians, actors, and painters. Drawing and painting were her first loves, but while studying at UQAM, printing and bookbinding became part of her practice. She works as an artistic makeup artist and teaches workshops in most of the disciplines she loves. Pennie Lynch – Woodworking Artist - Another local talent, Pennie will display and explain her woodworking creations. 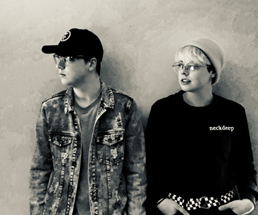 Morgan, Damian, and Jesse Roberts – Les Jeunes Entrepreneurs; - Students at Richmond Regional High School and St. Francis Elementary, these young artists will demonstrate the process of making soap. The Waterboys - A trio of multi-talented musicians, Alex Kehler, Nicholas Williams, and Andrew Wells-Oberegger hail from the Eastern Townships. All three musicians are singers and multi-instrumentalists, and their concert features the fiddle, Irish flute, tin whistle, bouzouki, guitar, accordion, bodhràn, nyckelharpa, sackpipa, bombard, and more! 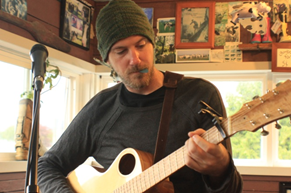 Matthew McCully is a singer songwriter living in Sherbrooke, Quebec. His lyric driven songs are rooted in the folk tradition, but through his appreciation of world music and his choices of instrumentation, his unique sound is a challenge to define. Amy and Andrew Rutherford - This brother and sister team are both alumni of Richmond Regional High School. They are passionate about music and have played many shows together. Not one particular style can define them, as they play many different styles; from Irish folk music to punk and heavy metal! Their instrumentation of two guitars is simple yet can create a great atmosphere. At Ste. Bibiane church, 970 Principale N. Richmond.